We are fortunate to live in an advanced age at the turn of the 21st century. Electronic devices are always with us in our world today and make our every day interactions with our environment easier and safe. Although there are many positive effects we enjoy from these devices in our everyday lives, but a more dangerous side exists to all of this progress and convenience. Blue light, also known as high energy visible light, is emitted by numerous electronic LED devices, and is a worrisome threat to eye health which was previously unknown and irrelevant in the past. Computers, tablets, e-readers, smartphones and other electronic devices with visual displays all can cause tired eyes, digital eye strain and computer vision syndrome. Digital eye strain is the physical discomfort felt after two or more hours in front of a digital screen and is associated with the close to mid-range distance of digital screens, including desktop and laptop computers, tablets, e-readers and smartphones. Digital eye strain symptoms include: dry, irritated eyes, blurred vision, eye fatigue, neck and back pain and headaches. Prolonged periods of use appear to exacerbate symptoms of eye strain as 96 percent of Americans who experience digital eye strain spend two or more hours each day using devices. A combination of factors foster the onset of digital eye strain, including the proximity of the screen, the frequency and duration of use and the degree of exposure to high-energy visible (HEV) or blue light emitted by video screens. The optical industry has developed lens technology to alleviate vision problems and protect eyes from blue light, glare and other environmental stressors. 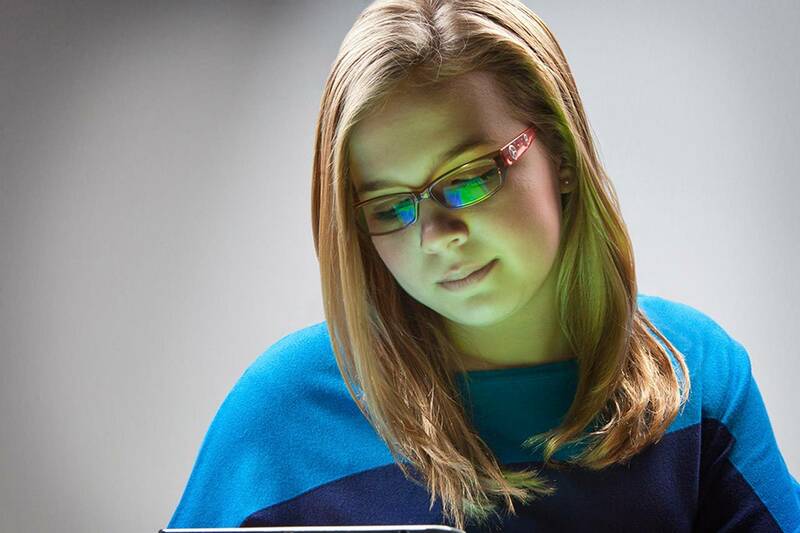 BluTech Lenses which are unique lenses specially created to selectively filter out blue light, increasing visual comfort and reducing eyestrain. These lenses offer an extraordinary cutting edge filtering agent within the lens material itself that replicates elements in the eye, called ocular lens pigment and melanin, which the body naturally produces on its own, and which help filter out the correct amount of blue light entering the eye to defend against unfettered blue light penetration, while permitting appropriate visual contrast. Recharge is another sophisticated choice to help minimize the harmful effects of blue light. HOYA is the advanced eye care company that manufactures these lenses, which reflect nearly 30% of harmful blue light away from the eye. Between the filtering effect of BluTech and the reflective properties of the Recharge coating, a great percentage of otherwise extremely harmful blue light never reaches the eye. This is an important element in the long term health of your eyes. If you are using your phone constantly — especially if you use it primarily for texting, e-mailing and web browsing — a convenient way to reduce your blue light exposure is to use a blue light filter. These filters are available for smart phones, tablets, and computer screens and prevent significant amounts of blue light emitted from these devices from reaching your eyes without affecting the visibility of the display. Melatonin helps us sleep & blue light causes a reduction in melatonin production, so we can’t sleep! Therefore, it is good to avoid digital screens one hour before sleeping, especially in children. For more on blue light protection, digital eye strain and how to protect yourself, don’t hestitate to contact your doctor in Lathrup Village, Michigan.